It was a little overcast, a fair bit of cloud hanging around today. But I decided to	go to Wet 'n' Wild. I got there at 9:45am but the park didn't open till 10:00am, so after a little wait, I made my way into the park. I found a nice spot in front of Surf Lagoon, the main area and had a sit for a while before going for a walk round the park. I went off and rode a few flumes, The Blast, Mack 5, and The Flyer. These were fun and I would come back to these many more times during the day. I came back to Surf Lagoon and spent some time in here. A stroll around the other side of the park, and I find, The Lazy River, and Bubba Tubs. The Lazy River is one of those circuits that you can just float around, in a rubber tube. I came back to this many times. 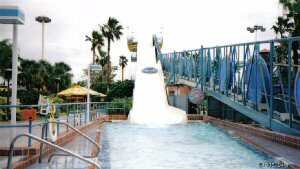 After a bite to eat, I went on The Surge, another good flume, rode a few of the others again, and spent some more time in Surf Lagoon. 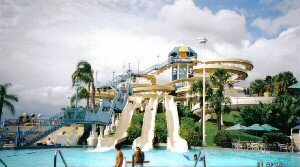 Surf Lagoon is a 17,000 square foot pool with a wave machine capable of 4 foot waves. There were about four settings each lasting 8 minutes, with an 8 minute break in between. I decided to start to get ready to leave around 4:00pm and by 4:30pm I was ready to leave. This was another fun day, and also rather relaxing at times. The weather turned out nice too.